History lessons are, by nature, elongated and tedious affairs full of facts and figures and not much else, but when you combine history and live music things become interesting and entertaining. Fast. 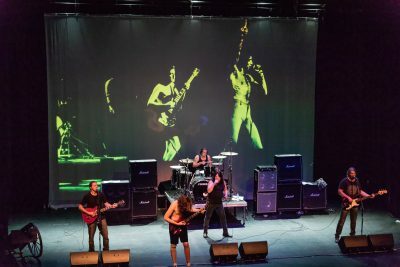 Such is it with The AC/DC Story, a three hour plus interactive performance that documents the life and times of one of Australia’s finest ever musical exports. It is a show that will inform and entertain, with the famous bells from ‘Hells Bells’ and the cannons from ‘For Those About to Rock’ making a welcome return. It is an all encompassing spectacular that tells the story of AC/DC with music and allows you to actually feel and enjoy the journey from a unique and rewarding perspective. Accadacca have been belting out all of your favourite AC/DC tunes since 2000, with vocalist Larry Attard having supported and run in the same circles as an up and coming AC/DC in their early years wit the occasional drinking with Bon himself at The Victory Hotel Sydney as well as… well you will just have to catch the show to hear the rest. AC/DC from their very beginning. As its turned out, Larry’s voice is extremely similar to Bon’s (as quoted in Australasian music magazines) and he belts out the late great front man’s material with ease. At one stage in the early 80’s it was thought Angus and Malcolm Young (AC/DC) were considering Larry for the front man’s job after Bon’s untimely passing, as both Malcolm and Angus were spotted firmly fixed on Larry at a SNAKE gig in Sydney. SNAKE is Larry’s “originals” band and word had obviously reached Malcolm and Angus Young about the uncanny similarity of Larry’s and Bon’s voices . Larry was then called into Alberts studios Sydney to meet with George Young and Harry Vander, however and at the end of the day, the position was given to Brian Johnson. 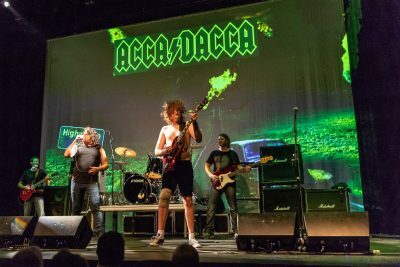 If you ask Larry Attard he will tell you that forming a band such as ACCA DACCA was the last thing on his mind, nonetheless and with masterful persuasion from fellow muso’s and interested promoters, the decision was made to give it a try , and so was conceived, with jaw dropping results, ACCA DACCA ! 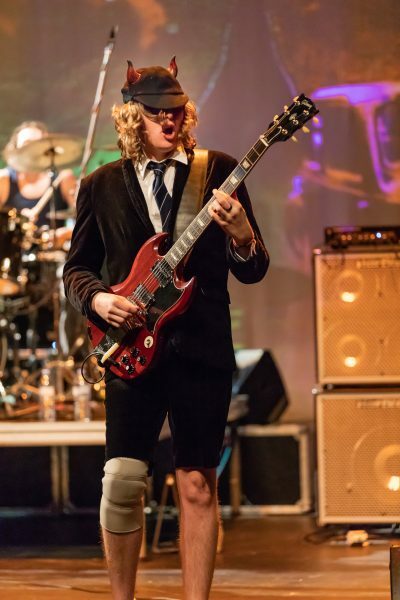 Despite going through inevitable line-up changes, Attard and son Jesse (lead guitar) have been the two constants in the band, with Jesse having first operated lights for the band while his Father belted out the tunes when he was just six years old. From there he progressed to drums before a seemingly endless run of trouble with the lead guitarists performing the Angus role in the band forced him to pick up the guitar. 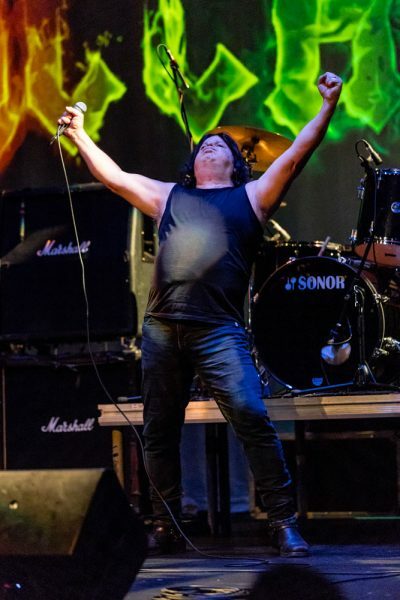 While still enjoying the nightly thrill of performing AC/DC’S hits, early last year Larry decided it was no longer enough to play to pub crowds and outdoor stages. The fans were hungry for more than music – they wanted to know the behind the scenes moments and decisions that helped shape AC/DC. Spanning over three hours, the AC/DC Story doesn’t just bombard you with hit after hit, it more focuses on the journey of the band from humble beginnings to their current standing among the world’s elite bands told through the words and images of what was a group of young, inexperienced musicians who were at times out of their depth but had a tenacityand cheeky flippancy that forced the world to take notice.